MANILA (AFP) - A self-proclaimed Philippine sultan said on Tuesday his gunmen would "fight to the last man" as Malaysian troops mounted an operation to end a deadly three week-old stand-off in Sabah on Borneo island. "The crown prince, the royal security forces, and the many patriots who landed (in Sabah) voluntarily will fight to the last man protecting their ideals and aspirations," their leader Jamalul Kiram III said in Manila. 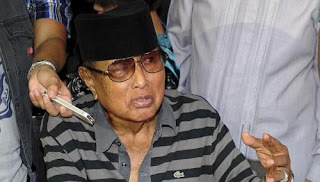 Kiram sent his younger brother Raja Muda Agbimuddin Kiram and several dozen supporters, some armed, to the Malaysian state of Sabah on February 12 to stake a claim on behalf of the heirs of a defunct sultanate which once controlled parts of Borneo, including Sabah. The self-proclaimed sultan said the gunmen's leader was his crown prince and was leading the sultanate's "royal army". Malaysian security forces mounted an air and land offensive on Tuesday to end the deadly stand-off that has claimed 27 lives.